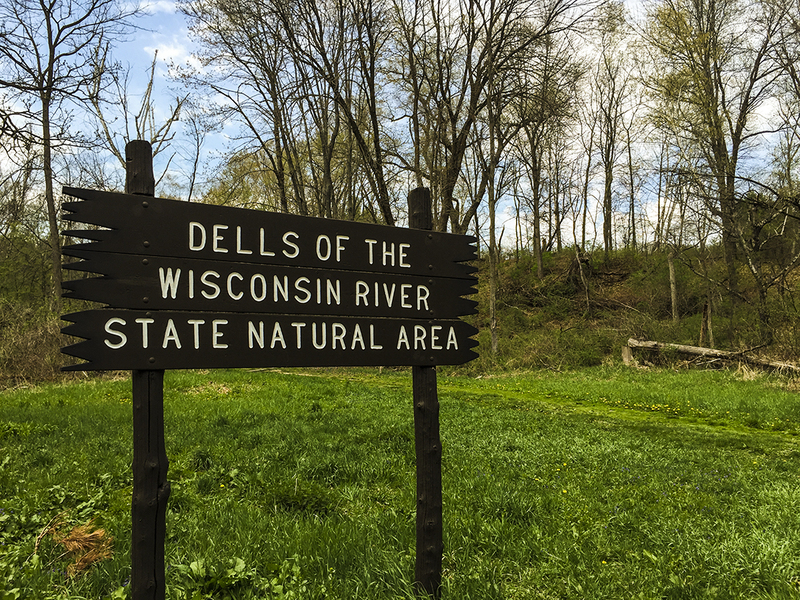 The Dells of The Wisconsin Natural Area is a nature preserve along the banks of the Upper Dells at the mouth of The Narrows. You can access this area via a parking lot on River Road near The Birchcliff Resort. The Chapel Gorge hiking trail blazes through hardwood and Norway pine forest for two miles. 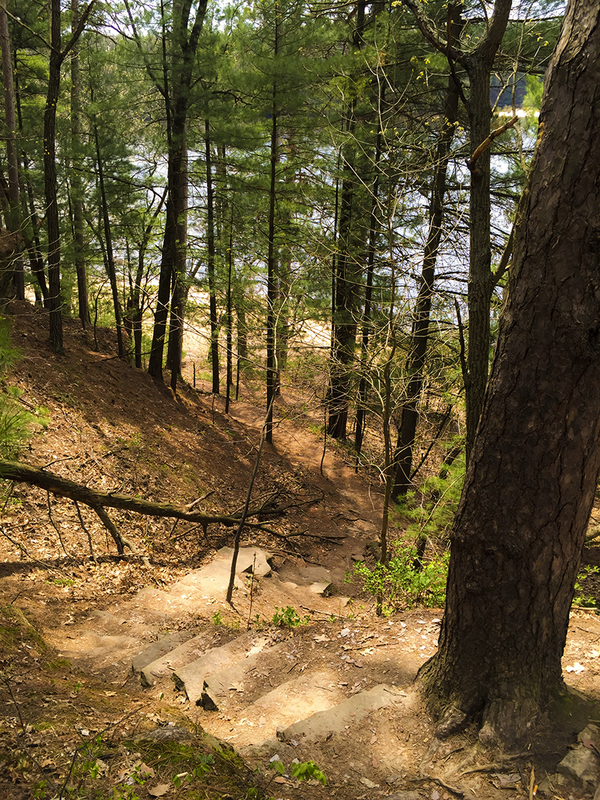 This easy two track walking trail eventually leads to a "secluded" natural beach at the point where the Wisconsin River exits The Narrows. 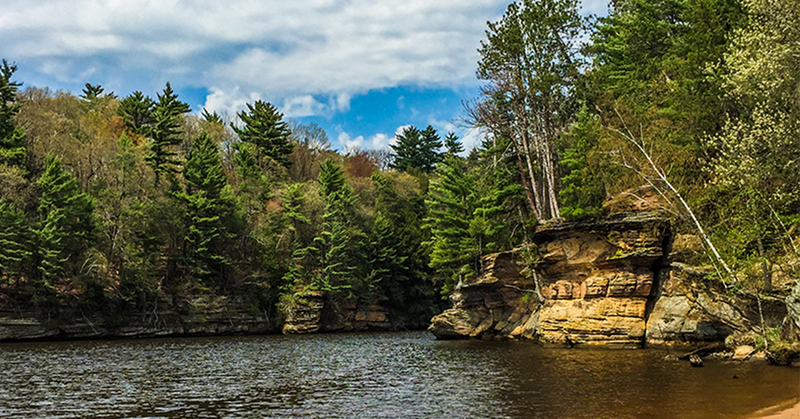 This scenic spot is a great retreat for locals and visitors to Wisconsin Dells. 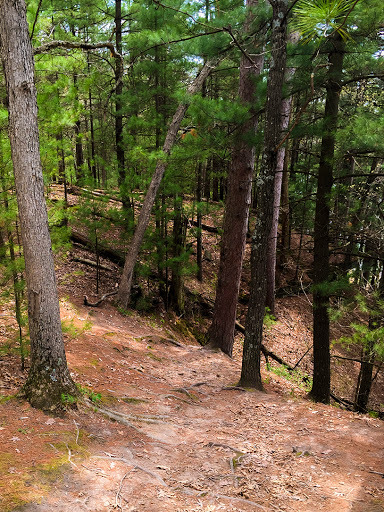 Nestled in between a parade of mega resorts and the ballroom blitz of downtown Wisconsin Dells sleeps a quiet and (secluded) state natural area. You've passed by it on your way to the golf course on River Road, or on your way into town for the barbecue buffet. But, yet, there it is as it has always been .. the original Wisconsin Dells attraction: Nature. 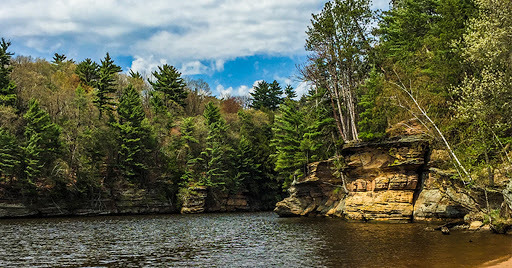 If you really want to get up close to the natural wonders of carved sandstone towers and mysteriously deep green gulches you'll have to take the Dells River Boat Tours or ride a Duck. You can't walk into Witches Gulch or Coldwater Canyon. 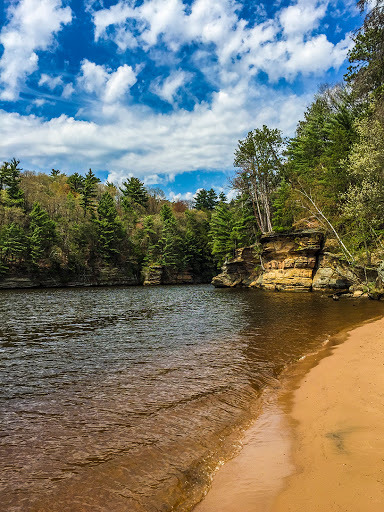 But, you can walk down to a natural beach at the point where the wide Wisconsin River twists and turns through its infamous and deadly Narrows. 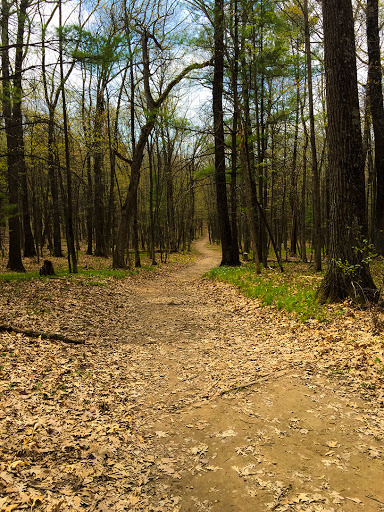 The walk itself is a 2 mile loop through a hardwood forest. But, the beach is the real attraction here. As far as beaches go in Wisconsin, this one is as close as it gets to picture perfect. You'll want to lay out with a good book and take in the rays for the afternoon. But, prepare your best pose. Boatloads of tourists will be instructed by their guides to ready their cameras as they round the bend to enter The Narrows. This secret place is usually frequented by staff members of the various Dells shops and resorts - the people who are just looking to get away from the hustle on their breaks. 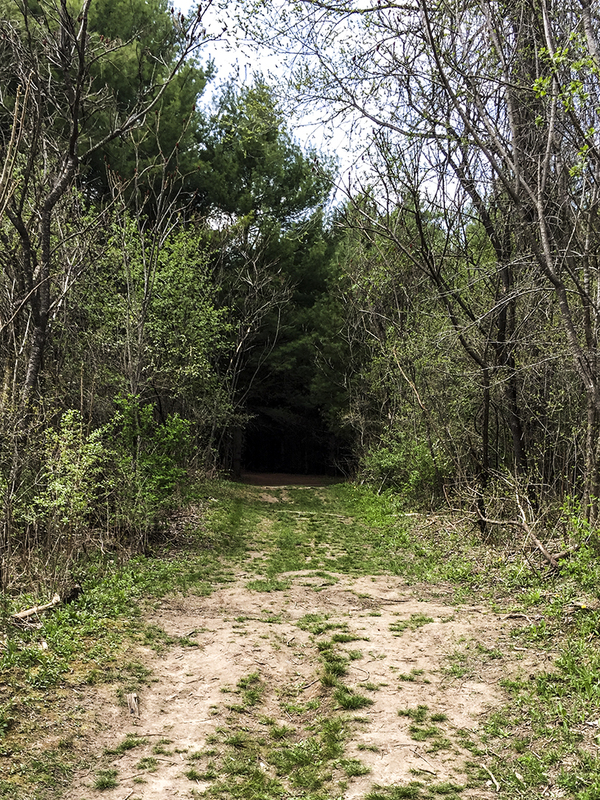 And, even though I'm writing about it as so many others have already, it will still be just as secret as it has always been ... a great outdoors escape hiding in plain sight. 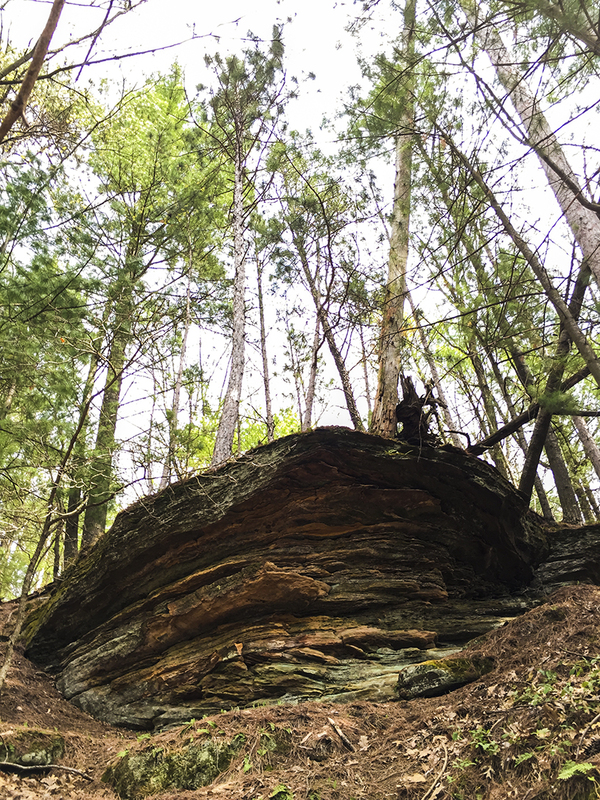 Echo Rock is a time weathered sandstone bump that is irresistible to clamor around, under, and on top of. Gentle Mirror Lake laps at it's base on three sides. 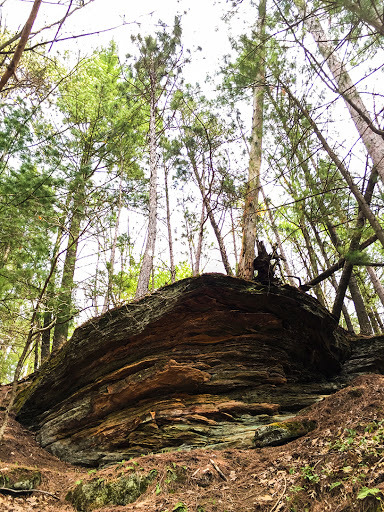 While Echo Rock is elvishly small, it is home to a thriving family of towering white pines including one of the oldest and most wizened pine trees I have seen in Wisconsin. 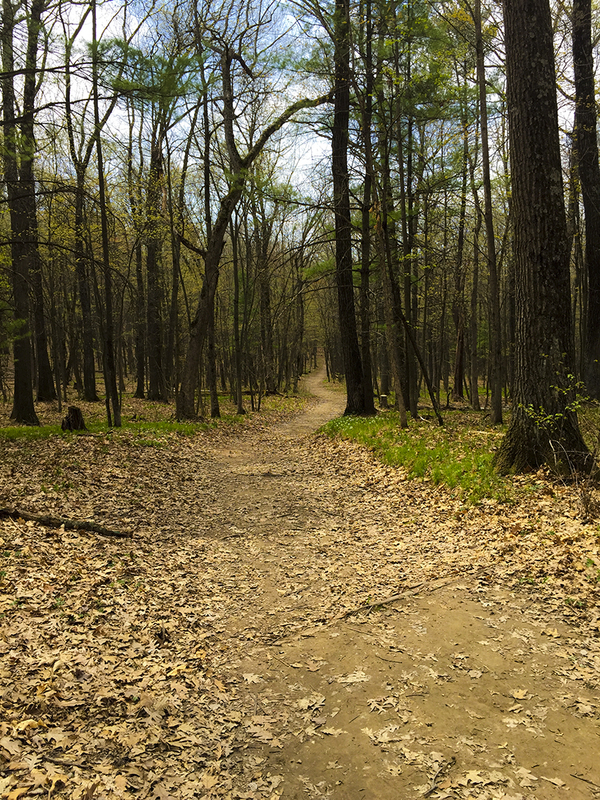 Wisconsin is home to Three National Trails, countless state park trails, nature centers, and land preserves. This is a directory of every qualifying footpath hike in Wisconsin that I have written about. Every weekend this list grows longer.